the fat. Add the remaining ingredients. No simmer, uncovered, 30-45 minutes until Chilli Dog Sauce thickens. Stir occasionally. Allow to cool, cover, and refrigerate until ready to use. Bring a 2 qt. saucepan of water to a rolling boil. Remove the saucepan from the heat, and add the desired number of frankfurters to the water. Cover and let sit about 10 minutes. When the frankfurters are cooked, microwave the desired amount of chilli dog sauce until steaming. Now warm the rolls in the microwave for 10 seconds. Remove the cooked frankfurter, and place in the rolls. 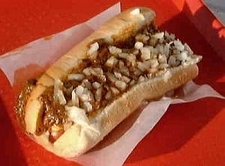 Add around 3 tablespoons of your Chili dog sauce and the chopped onion. Add grated cheddar cheese if you want to finish off.